This targeted analysis addresses mountain territories where high degrees of biodiversity and natural capital hotspots are localised, and experiences on their preservation, management and monitoring were gathered. Mountains cover 41% of the territory in the ESPON space and are home to 17% of its population with 16 massifs (ESPON GEOSPECS 2013). Mountains can be seen as “inner peripheries”, “marginal” areas from a socio-economic perspective (ESPON, “Inner Peripheries”, 2016), where the issue of accessibility to services should also include ecosystemic ones (MiSE, “Inner areas”, 2015). Mountain issues assume relevance in key themes for sustainable territorial development such as ecological connectivity and natural resources management (e.g. water, forests, soil). The U.N. Sustainable Development Goals mention mountains with reference to water management, efficient use of natural resources, ecosystem and biodiversity, ensuring mountain ecosystems conservation and enhancing their ability to provide benefits that are essential for sustainable development. 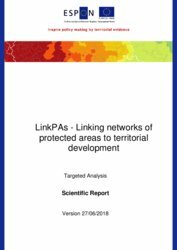 In this sense NPAs contribute to defining common visions and scenarios for sustainable development of homogeneous areas. Endogenous natural capital can thus contribute to sustainable regional economic cycles and provide inputs for a green economy that NPAs should be able to promote. The ecological conditions and vulnerability of the territory require also strategic and integrated policies for both natural and urban areas. According to IUCN (International Union for Conservation of Nature and Natural Resources) a protected area is a clearly defined geographical space, recognised, dedicated and managed through legal or other effective means, to achieve the long-term conservation of nature with associated ecosystem services and cultural values. Europe’s Natura 2000 and the Emerald network under development are international European networks of protected areas that catalyse biodiversity conservation. The topic deserves being tackled with a wider territorial and spatial planning perspective, embracing core natural areas and related buffer zones and urban areas. At EU level, valuable experiences are the specific Protocols of the Alpine and Carpathian Conventions recalling the necessity for NPAs and the integration of the objective of conservation and sustainable use of natural assets into sectoral policies. In this sense, NPAs contribute to achieve EU and international objectives. The EU Biodiversity Strategy to 2020 encourages cooperation and dialogue with key sectors and stakeholders, as well as the development of mechanisms for biodiversity (e.g. Business@Biodiversity Platform; The Economics of Ecosystems and Biodiversity initiative), ensuring that these issues are reflected in decision-making at all levels. A territorial development approach based on NPAs could also be transferred to other types of territories, whether they are mountainous (Pyrenees, Dinaric Alps) or not (e.g. coast-maritime areas as with the Adriatic Protected Areas Network, DANUBEPARKS, the network of protected areas along the Danube River). It represents a perspective for both ESPON countries with no experience in NPAs and non-ESPON countries (e.g. Bosnia Herzegovina, Serbia, Montenegro, Albania) seeking to integrate natural capital into territorial strategies and meet EU targets.